Detoxification is the body's natural, ongoing process of neutralising or eliminating toxins from the body. Toxins (anything that can potentially harm body tissue) are transformed chemically to less harmful compounds and excreted via stools or urine. Our bodies are assailed day in, day out with chemicals from environmental pollutants, medications, contaminants in our water supply, pesticides and hormones in our food supply, alcohol, and the list goes on. As the toxic load in our bodies becomes increasingly alarming, detoxification is indeed important for our overall good health. Although our body's natural detoxification processes are quite amazing, there are now over 70,000+ chemicals in existence, and most have been developed in the past 100 years! The human body has simply not evolved quickly enough to keep up with this growing exposure to toxic chemicals. We recommend that any detoxification program is undertaken with assistance from your healthcare professional to ensure that you are providing your body with the right nutrients at the right time. Your healthcare professional will also be able to support your unique requirements and monitor any adverse reactions or side effects which may occur as your body is cleansing. 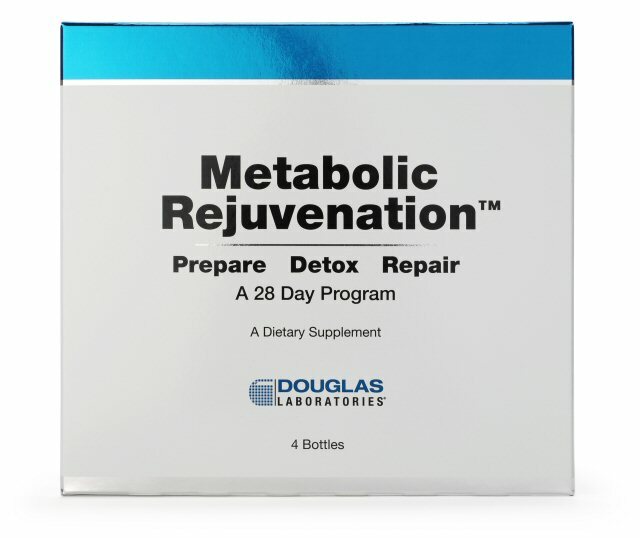 Metabolic Rejuvenation from Douglas Laboratories is a comprehensive 28-Day, 3 phase detoxification support program with nutrients specifically chosen to prepare the body through elimination, support phase 1 and 2 liver detoxification, and repair the body and intestinal tract. Dr Peter Richard Pedersen DC DO NTMD CIM CDN - “The Metabolic Rejuvenation program is without a doubt, the best detox program I have ever tried”. “Over the past 40 years I have tried many detoxification programs. From the age of 18 when I went vegetarian right through to the many and varied detoxification rituals too numerous to list. The Douglas Laboratories Metabolic Rejuvenation program iswithout a doubt, the best detoxification program I have ever tried”.